When Tammy Theriault invited me to do an interview at her site, I knew it would be different. I knew there was a reason for the survival badge. How weird was it? Come sample the insanity HERE! 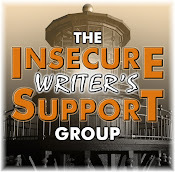 Ilima Todd just signed a two-book deal with Shadow Mountain – congratulations! Mel Chelsey’s book, Adversarius, Shadow of the Rose: Book One, is now available in paperback on Amazon. Sean McLachlan’s fantasy novella, The Quintessence of Absence, is now available! The 25,000 word story originally appeared in Black Gate magazine. Congratulations, Sean! Jade Hart’s latest novel, Mirror Amour, is now available. Way to go, Jade! The Best/Worst Movie Remakes Blogfest is this Friday! Name the best and worst movie remake you’ve ever seen. Sign up HERE. 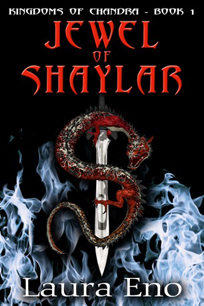 Laura Eno’s Jewel of Shaylar is now available! Purchase at: Kindle US, Kindle UK, Nook, Smashwords, Kobo, Trade Paperback, and Goodreads. How does May Monster Madness work? 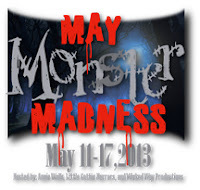 Well, it's a blog hop featuring posts about monsters! Anything you can think of as long as it has something to do with monsters... crafts, lists, movies, funnies (a personal favorite)... anything! I decided to go with my favorite monster as a kid - Godzilla. Nothing was cooler than the Saturday afternoon monster movie featuring Godzilla. He’s ingrained in my childhood forever. He began as a terrifying, giant monster, and over the years became more of a protector and almost loveable creature. Godzilla changed the way I looked at monsters. And it didn’t hurt that Blue Oyster Cult did a tribute song to Godzilla! Visit Annie Walls for other participants or to join this blogfest! 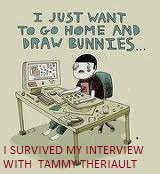 Have you ever been interviewed by Tammy Theriault? Excited about the new releases? Ready for Friday’s blogfest? Picking up Laura’s book? What is your favorite monster? Godzilla fan? And care to comment on the meaning of the cabbage…? Don’t forget to visit Tammy Theriault! I wasn't but I will be....hopefully! How funny, I was drawn to the site by the originality. Laura's book sounds terrific. And I'll go check out your interview. As always Alex a post full of news and information but why the cabbage for Gary?????? Nice news update...I always get the scoop here. I'm sure you had a wild time at Tammy's! I will have that riff running through my head all day long Alex. Great tune! Congrats to Laura and Ilima. I like the cover Sean settled with. It's nice and clean. Saw the ones he posted, but couldn't decide which I liked. This one is clean and elegant. Checking you out at Tammy a little later. Saw the interview. It was so funny! Here's my MMM'S for today Carmen Jenner Author and Book Me! That is a freakin awesome cabbage! Oh, and the Godzilla post wasn't too bad either! Great stop. i stumbled on this little piece of radness too http://www.youtube.com/watch?v=vdn4L6M7Aog. Here's my day III MMM at Design du Jour. Me interviewed by Tammy past. Ah Godzilla, probably my favorite movie monster (although not a good remake). As far as my favorite movie remake, I would probably go with The Italian Job. I am heading over to read your interview now! Godzilla is pretty cool as far as monsters go. I'll pop over to that interview..
Sean's novella sounds interesting; I may have to add that to the pile. Godzilla's my favorite monster too. I used to watch the Saturday morning cartoon of him when I was a kid. Of course, that meant dealing with Godzookie too. Yvonne, you have to go back to my last post to find out. Optimistic, that was a good remake. I am off to read the interview now, well at least I was, now I am too busy pondering the meaning of cabbage. Sorry, I hate cabbage. Maybe you do, too, and that's why you showed it sliced in half? As for cabbage, it's only palatable if slathered with butter, and I do mean slathered. Very confused about the cabbage. Looking forward to your blogfest on Friday, though. I've often wondered about the meaning of life...but never the meaning of cabbage. Do tell. And I couldn't get past the jerky editing in Godzilla to get scared. Dracula was my scary guy. I used to sweat like hell in the summer when I was a kid by keeping my windows closed so a bat couldn't get in. I told my mom I was afraid a bird would get in. Loved Godzilla as a kid. Best. Monster. Ever. Congrats to the Ninja's with upcoming releases! Was never much for Godzilla. More of a King Kong fan myself when it comes to urban distruction;) lol. Sound like some super fun bloghops coming up! Tons going on at your lawn and yeah I'd rather take the guy in his rubber then that crap remake of Godzilla too. Hmm sounded wrong, just a bit. I still don't know why the cabbage. Laura's book is getting a lot of exposure today, congratulations. Haven't checked your interview yet, but I will. I haven't been interviewed by Tammy but I'm heading over there now to read your interview. Congrats to Laura! I love the cover of that book. Just heard about Laura's new book. The premise sounds really interesting. Man O Clay, it's good in hot and sour soup. Donna, and he wasn't even in the original version of Gojira. Brian, I remember that short! The thing I loved about Godzilla is how he'd just kick a building down. All of these modern villains rig elaborate explosive devices that takes half an hour of plot just to understand, but no, not Godzilla. He just gets a nice running start and punts the Empire State Building like a big rectangular football. Guess I'll have go see Gary cuz you have me stumped on the cabbage...Looking forward to the blogfest - yours are always so much fun. Heading over to see how Tammy tortured you! The meaning of cabbage? Gas? Oy! Just over at Tammy's. That was a whirlwind! I'm one of the few that liked the Godzilla remake. Sure, some of the dialogue was cheesy but I though Godzilla destroying Manhattan during a storm was pretty darn awesome. Looking forward to the new remake of Godzilla too! I'm off to see Tammy. I'm still laughing over the survival badge. Friday should be epic! I can't wait to read all the posts! Great cover for Laura Eno! Favorite Monster? I'm fond of The Alien, from Alien. Perhaps not a typical monster but it scared the crap out of me when I first watched it. Good song by Blue Oyster Cult! Thanks for the shout-out! And your interview with Tammy was hilarious. Glad you made it out alive. Maybe Gary is trying to avoid cancer??? Brandon and Bryan, good point! Karen, that's a good one! Heather, we'd never seen anything like it, which was another reason it was scary. PK, a lizard that flames should always beat a furry ape! Yay for Laura's FANTASTIC book! One of the best things that could happen to me as a kid was a Godzilla marathon on a weekend afternoon. I was always bummed when it finally ended. Very curious to see how Legendary Pictures handles it, and if it will eventually cross over with Pacific Rim like Del Toro wants. Followed along to Tammy's. Loved the interview. And congratulations to Laura. Yeah, Godzilla! But I've said that before. I'll check out the interview. Happy Monday! Thanks for all the links and info. Will head over to Tammy's! Godzilla will never die! :-) He is a great monster. Heading over to Tammy's now. Good luck to everyone with new books! And congrats to Ilima on her contract. I already visited Tammy's page. Great fun interview! I was never much of a Godzilla fan. Hey Alex! Had a blast and anything weird for Gary seems normal. Go Ilima and all the other success stories!! I like the taste of kimchi. That's made from cabbage. I too am a fan of Godzilla. I liked the whole Monster Island thing with the two tiny girls that would sing to the giant moth. That was a frigging hilarious interview! Let us know when you are done with Honey Boo Boo. Apparently, Tammy has great taste in interview subjects. Either that or she's one brick short of a load. Nah, she has great taste! I used to watch Godzilla movies with my dad when I was growing up. So many friends, so many books! Congrats to all! And who knew Tammy, or you, could be so out there?!! Oh hey, did you hear? This morning on the Today Show, Bradley Cooper admitted to always wanting to be a ninja! In the monster category right now I'm feeling...Dragons. Congrats to all the authors of new releases today and what's up with giving Gary cabbage? Why not some Chinese Take out? Will check out your interview with Tammy, she's a riot. I remember watching the Godzilla cartoon when I was a kid! I love Gary, and I'm intrigued. Does Penny eat cabbage? So many fun books and links. I'll go check them out. So much news going on! I survived a Tammy interview too! She is crazy with the questions, but I am crazy with my thinking, so it was a perfect fit! John, those marathons were always cool. Godzilla would make a great crossover with Pacific Rim. Joylene, I'd go for great taste. Nancy, I'm ahead of Cooper - awesome! Robyn, not sure any dog eats cabbage. OMG I loved to watch Godzilla movies, they were (are) the coolest ever!! Hadn't thought about them in a while. Oh and cabbage...I like it. Hmmm... I can combine 2 themes here. cabbage was one of the monsters of my childhood. Along with okra (shudder) and dandelion greens. Gareth should do a great job on his Godzilla movie Alex. He said, "I guess I will say I’m highly aware – and everyone involved is incredibly aware – of everyone’s opinions on what this film has to do and what it has to be. And no one will do anything but the right thing. Without addressing anything specific, everyone knows how important is to get it right." He'll make it work if they give him enough creative control. I love the classic monsters of the silent and early sound era, including of course some of the original creations played by Lon Chaney, Sr.
Godzilla. I miss monster classics like that. I would say I wish they'd make a new one...but they'd probably just ruin it. Loved your interview with Tammy! And I am definitely intrigued with Laura's book! Sounds fabulous! so many great things happening to writers and i love laura she is a doll... congrats to all. i had a shoot on the beach today, girl in bikini... gorgeous. i love freelance that my job is too wipe the sand off between takes. Congrats to all the authors! Godzilla was one scary creature. I can't wait to see you over at Tammy's! Loads of great publishing news again today, congrats to all. Not sure about the cabbage reference??? Heading off to Tammy's blog! Lisa, okra still scares me. Maurice, I hope they give him that creative control. Sounds like he will be to Godzilla what Jackson was to LOTR. SL, Japan keeps making them, we just don't get to see them often. I use to love Godzilla and how off the audio was. It still makes me laugh-lol! Oh, Tammy will do a fab interview...off to visit! I've never seen a Godzilla movie! But as for cabbage, your post reminded me I'm going to shred some for fish tacos tonight. After your interview with Tammy, I think my approach will be, if she ever approaches me, to run away. Aside from being a gassy person, lolol! It a dimwitted person. I know you can't be calling Gary a cabbage head. Wonderful that you keep up with everyone's new book releases! I love the name "Quintessential of Absence". That's a hook right there! Congrats to all! Nope, never been interviewed. I'm off to read your interview now. I love Blue Oyster Cult. Godzilla was a man in a suit!??! Jamais!!! One of the trailers to ST was some film called "Pacific Rim" but the trailer started with this great big monster coming out of the sea and the first thing I thought was "oh my goodness, they've gone and done a Godzilla remake!!!!" only to discover it wasn't! I have no idea what the relevance of the preceding bit is to your post but I'm just back from watching ST and OH MY GIDDY AUNT!!!!! is all I'm saying!! Off I go to read your interview with terrific Tammy! Ah, Godzilla- our lizard friend from the east. How could you not love him? Lots of new releases. Very exciting! I'm so excited for Ilima!!!! And there's always good news on your blog, which I think rocks awesome balls because everyone is always doing such amazing things. Cabbage? Hehe. Your blog post titles always make me laugh! Johanna, you need to watch one! And one of these days I'm going to try a fish taco. Sia, that meant you were outnumbered on movie nights. Kitty, now you're taunting me! You're brave to get interviewed by Tammy. I barely survived myself! (But it was so much fun!) I'm excited for Laura. I'm a Godzilla fan, definitely. Ready for the blogfest - kinda. Love BOC's Godzilla, actually I also love Godzilla. I think he was just a poor misunderstood lizard. And, I'm not gonna touch that cabbage with a 10' pole. Godzilla is the monster of all classic monsters! There are a lot bloggers to congratulate! I'm ready for the blogfest on Friday!! Wow, lots of great information as always. 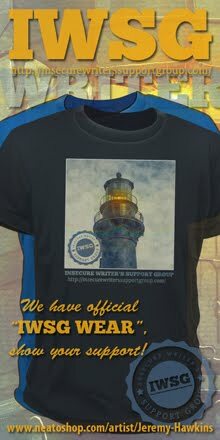 I awarded you the sunshine award on my blog. By the way, I read your interview at Tammy's and found it very interesting. Guess what I have on my bookshelf? That's right. It's the Ninja Handbook! Haha! I love that "I just want to go home and draw bunnies" picture! Cabbage heads from 2nd City TV? I miss that show... Cabbage Head vs. Godzilla and Gamera would be awesome. So many great books out - Tara, Ellie, Laura, Sean, and I'm sure I missed someone terrific. An interview with Tammy seems like an experience not to be forgotten! Congrats on your survival. I've only really seen the 90s remake of Godzilla - it was memorable because I saw it with my friends in a tiny village cinema when we were hiking in the Lake District, but it was pretty bad! I've heard interviews with Tammy can be quite intimidating. I'll stop by and check yours. (I'm sure you nailed it!) Godzilla always cracked me up - he was too rubbery to be scary! I love Godzilla! I even have a niece nicknamed Gabzilla because she destroys her brother's LEGO cities. As for cabbage, I define it in one word: coleslaw. I've always had a soft spot for Godzilla, the rubberiest of all monsters. Christine, we can sport our badges with pride. Faraway, you are extra cool! Carrie, are you prepared to be a Ninja? Mary, that made me chuckle. Thanks for the book announcements. Laura Eno's book and The Quintessence especially caught my attention. As for monsters, I think Frankenstein (the original from the 1930's movies) will always have a warm place in my twisted heart. But it was the original Mummy that scared the crap outta me. When it comes to Gary, I don't want to even hazard a guess as to the cabbage reference...lol. I'm with you about Godzilla. But, hey, "The Blob" is historic cool. Cabbage? Hmm, he likes kimchee? Laura Eno's book sounds really good! I love the cover. Hope you found the time to draw some bunnies. When I'm finished here, I shall go check out your interview with my adoring fan, Tammy. Look at all those links to all those wonderful people. I think I have the missing link, but that's another story. Speaking of Godzilla. Aint the classic movie, "Bambi Meets Godzilla! ", worth an academy award. Yes, me also been interviewed by the gosh darn lovable Tammy! Thank you, good sir. Lettuce think some more about cabbage. Mark, I'd go all the way back to the first Godzilla. Cold, that's good to know! Gary, that was a funny short. And knew you would appreciate the cabbage. Even if no one else had a clue. Aren't cabbages where they grow those Cabbage Patch dolls? Will check out the interview. I could never figure out where BOC got the idea for a song about Godzilla unless it was a metaphor for the dangers of history repeating itself...or some such. Anyway it was a fun sing a long! Cabbage = sauerkraut = yum! That was an interesting interview...I can't say I've ever read one quite like it. Haha. Congrats to Laura on the release of her new book! I have no idea what the cabbage means...hopefully, you'll tell us on Wednesday. So many new books. This makes me happy. The meaning of cabbage is to be turned into coleslaw right? I haven't been interviewed by Tammy, but some day! Godzilla. I remember watching it from behind a chair on Monster Movie Night. I was supposed to be playing with the other kids, but I liked the scary monsters even then. Go Go Godzilla! Zombies have always been the scariest monsters to me; but I think I love a good old fashioned Dracula movie. You know, before they glittered and had angst about being a vampire. Pahaha, your interview with Tammy is fantastic! Chuck, either way, I'm glad they geeked out and wrote the song. DWei, that's one good use! I never heard of Tammy, but after that badge, I HAVE to check her out. Always liked Godzilla too. They're doing a remake in 2014?? Hadn't heard that one! Cabbage to me means pork & sourkraut with mashed potatoes. YUM! Ooooh that sounds like such a fun blogfest! Wish I could jump in. Godzilla was always fun to watch! Godzilla is a cool monster. I would love to create one such monster for my children's books. Will hop over to Tammy's to read your interview. I have a great stuffed-unstuffed cabbage recipe from my mother-in-law, which uses green cabbage. I love putting red cabbage raw in salad. This was quite the diverse post! Back safe and sound in my WONDERFUL office. The sunshine is streaming through the windows and it's warming up to 88 ... YAY. I arrive yesterday and it was a freezing 50 degrees! THAT'S CHICAGO. I just read the interview at TAMMY's ... LOVED IT! I so needed that laugh. You guys are hysterical. I have a BAZILLION things to do, but I want to BLOG. SO I will.... LOL. Already spent the early hours unpacking. SO NOT FUN. AN explosion of clothes, books, cds, baking stuff, food, gadgets, and what nots are ALL over my condo as I write this. My boys loved those Gozilla movies when they were little. We had lots of them on VHS. Not ready for Fridays yet. Terri, they are making another one! Theresa, I'm all about the variety. Michael, one thing at a time! You have all day to organize. Enjoy some blogging. And glad the interview amused you. Hi Alex .. Of cabbages and Gary - that was one long search! Found him and comment ... love the photo of the cabbage though! Fresh spring cabbages are just coming in here ..
Must get over to check out your interview with Tammy .. bought Laura's book, and yours on Kindle - I'm up and running finally, and Sean's novella looks a good read ..
Monsters? I think I forgot to post, or did I sign up? Anyway, my favorite monster is still Sully or maybe one of the fake ones from Scooby Doo. Hahaha! I'm DYING to go read that Tammy interview... I bet it's awesome!!!! And I'm so happy for Ilima! Such great news. And I hope you're doing well, Alex. Feels good to finally be back into the world of blogging! Yes, I think The Quintessence of Absence is a very interesting book! Lots of great books coming out. I loved Godzilla as a kid too. My brother and I would watch them and laugh. So awesome! Godzilla, and I have to add King Kong(! ), are two of the best monsters. Not a fan of that song, sorry! Skipping the monster fest, nothing to contribute. Tyrean, and they would've gotten away with it had it not been for those meddling kids. I'm going to go with the non-compliant cabbage patch award on this one. It seems like it would fit Gary very well and he'd have a lot of fun with it. Godzilla scares me until this day and YES I'm so curious about the cabbage. Jeez I am behind. I don't know which way is up anymore. Godzilla was one of my faves, but I really dug Rodan cuz he could fly. Oh haha, I totally forgot about that Blue Oyster Cult song! Not sure I should thank you for the reminder. Fun trailer:) Thanks for sharing. Jewel sounds like a great read. Have a good one, Alex. I love Tammy's interviews, so I'm headed over now. Congratulations to Laura! And Godzilla rocks. Yay for all the releases! And I must admit, my nephews love Godzilla to an extreme measure but I've never really checked out any of the films! I have to admit I don't remember Godzilla from the movies, I remember him from the cartoon. I used to love that, even if it did mean putting up with Godzuki :). At least he was cuter than Scrappy Doo ;). Read the interview and posted. Glad no one got shot. You guys sounded like you had fun, and that's pretty cool. Cabbage is a fiber that goes with Swedish meatballs. Eeuueuw! Cabbage tastes great... but guaranteed to make my nights regrettable. Wow, loved the interview! Tammy sure gave as good as she got! Congratulations on the new releases everyone!!! Have to admit, I love cabbage, especially polish cabbage rolls my step dad makes! Favorite monster I hate is "The Blob." I know, sounds like I'm an idiot, but when I was a kid it scared the you-know-what out of me and I cried. Don't like "Bigfoot" monsters either, as I grew up in the woods. The interview was hilarious, Alex. I never knew what either one of you were going to say next! That head of cabbage could be a writing prompt, so yes, I believe you could get comments for posting just an image.